My aunt Phyllis contacted me recently to let me know that she came across a small box of my grandmother's vintage thimble collection and wanted to know if I'd be interested in acquiring them. 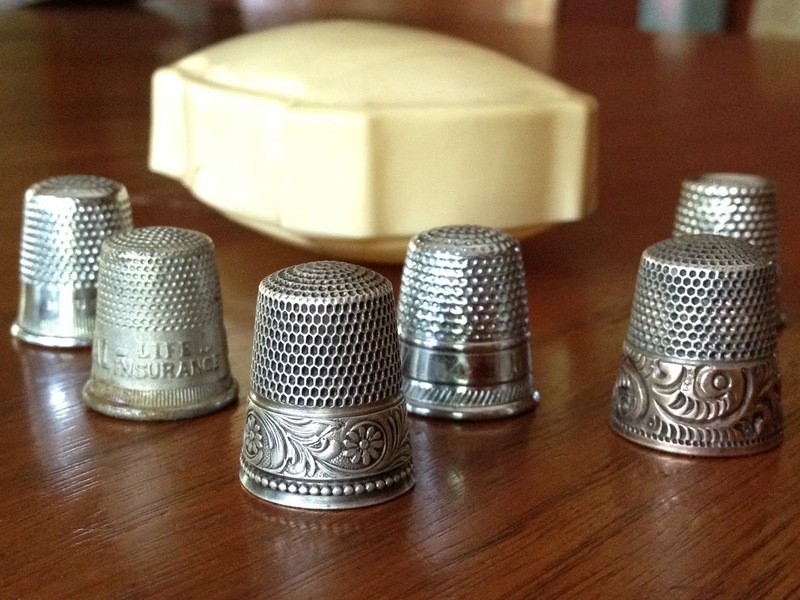 I didn't hesitate for one minute, having no idea what beautifully intricate thimbles were coming my way. When I saw the box in the mail yesterday my heart skipped a beat and my children watched me open the little package as if a magical troll was going to appear. I was amazed at her 6-piece collection with intricately designed thimbles in varying shades of silver. One was even from a Life Insurance company. It's the little treasures in life that bring the biggest smiles to our faces - thanks Bonnie! Ever once in awhile you come across a fabric you just adore. To keep pattern in tact, I made a very simple dress silhouette. The detail was in the bow at the neckline. I used a powder blue velvet ribbon for a softer texture.